Poll: Do you regularly drink more alcohol than the low-risk guidelines? The low risk weekly number of standard drinks in Ireland is up to 11 for women and 17 for men. A NEW SURVEY has shown that a significant number of Irish people see binge drinking as a part of Irish culture. The survey by drinks industry-funded group Drinkaware found that almost three-quarters of people think it was just part of Irish culture. As well as this close to half of people thought binge drinking was “no big deal”. 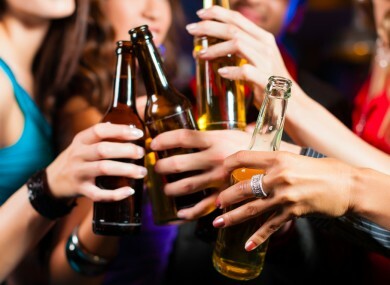 Binge drinking is defined as having six or more standard drinks over one period. One standard drink is equal to 10g of pure alcohol. A half pint; a single pub measure; a small glass of wine; and an alcopop all equal one standard drink. This means drinking more than eight pints in a week would be above the normal low risk limit. So, today we’re asking: Do you regularly drink more alcohol than the low-risk guidelines? Email “Poll: Do you regularly drink more alcohol than the low-risk guidelines? ”. Feedback on “Poll: Do you regularly drink more alcohol than the low-risk guidelines? ”.